"Binyan Shelomoh," a Hebrew grammar, Frankfort-on-the-Main, 1708; "Yesod ha-Niḳḳud," on the Hebrew vowels, Amsterdam, 1730; "Perush," a commentary, dealing with vocabulary and grammar, on the Midrash Rabbah to the Pentateuch, and the Five Scrolls, 1777; "Ẓohar ha-Tebah," a comprehensive grammar, with emendations entitled "Mikseh ha-Tebah," published at Berlin, 1733; "Ḳure 'Akkabish," in reply to the attacks of Grieshaber and Meïr of Prague upon his "Ẓohar ha-Tebah," Fürth, 1744; "Sha'are Torah," a comprehensive grammar, Hamburg, 1718; "Sha'are Zimrah," on the Hebrew accents and vowels, issued together with the preceding work; "Sha'are Tefillah," grammatical annotations on the prayer-book, Jessnitz, 1725. 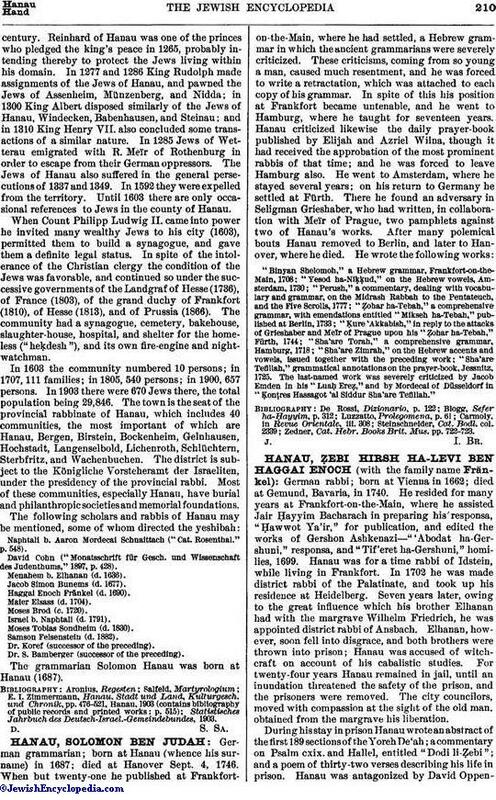 The last-named work was severely criticized by Jacob Emden in his "Luaḥ Ereẓ" and by Mordecai of Düsseldorf in "Ḳonṭres Hassagot 'al Siddur Sha'are Tefillah." Zedner, Cat. Hebr. Books Brit. Mus. pp. 722-723.